Tax Change Delivers A Blow To Professional Sports The change of a single word in the 2017 tax overhaul means professional sports franchises could take a big tax hit each time they trade a player. 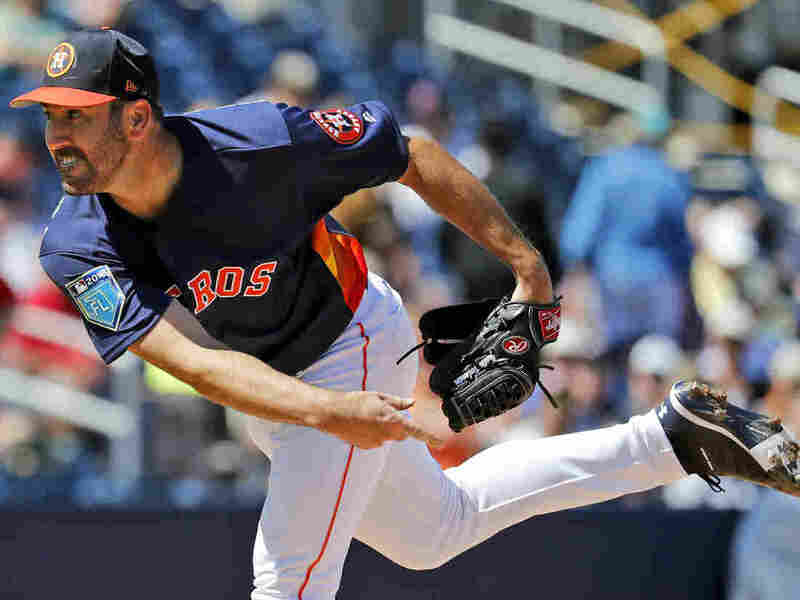 Houston Astros starting pitcher Justin Verlander was traded from the Detroit Tigers in a move that that experts estimate netted the Astros about $10 million, though no money changed hands between the two teams. A single four-letter word — added to a provision of the tax code — has professional sports leagues scrambling, as teams face what could be millions of dollars in new taxes. The revision changed a section of the tax code that applies to "like-kind exchanges." Under the old law, farmers, manufacturers and other businesses could swap certain "property" assets — such as trucks and machinery — without immediately paying taxes on the difference in value. The 2017 tax overhaul inserted the word "real" before "property." With that, the provision now applies only to real estate swaps. That means teams could be looking at tax bills in the millions for trading player contracts. Major League Baseball is already lobbying Washington to carve out an exception. Jim Tankersley, who reported on the issue this week for The New York Times, explains what the change could mean for teams, and how leagues are responding. This provision has been narrowed now, so that it only applies to real estate. And that excludes trucks and farm animals ... and baseball players. This is a $31 billion savings over 10 years, according to the Joint Committee on Taxation. There were a lot of provisions like this in the tax bill. Lawmakers call these changes "base-broadening," but what that really means is: they're raising some taxes to capture new federal revenue, in order to pay for the tax rates they cut. Lawmakers needed more money to pay for those rates, and the way they found that money was to close loopholes like the one that was in this provision. Right now, based on a ruling from the '60s, when teams trade players, [the players] are treated like a "like-kind exchange." ... A player contract is like a truck. But now, because they're not real estate, these players have to be traded in a way that there might be taxable values. What that means is, teams have to figure out how much a player is worth to them in dollar figures, and how much the player they might be giving away is worth. And if they're getting more back than they gave, they've got to pay taxes on that — capital gains taxes. So the question is: How do you value [each player]? Is he 'how many extra wins he brings to your team'? Is he 'how many extra wins he brings for how much money he costs'? Or is he some special formula of 'how much he would bring to you value-wise' that is different from one team to the other, because your team might have three second basemen and my team has none? The Houston Astros won the World Series last year. And on the way to winning the World Series, they traded for a pitcher named Justin Verlander from the Detroit Tigers. Some experts I talked to estimate that the value the Astros got back in that trade was probably about $10 million above what they had given up. So in that case, $10 million value, 15 percent capital gains tax — that's $1.5 million that the Astros would have give to the government. And the Astros have made several other trades like that over the last few years. That adds up. It's a real possibility that [Congress could just pass] the 'Make Sports Trades Great Again' Act of 2018 on a voice vote, because nobody wants to be the one who stopped their local team from making the trade it needed to win a championship. NPR&#x27;s Emily Sullivan produced this story for digital.